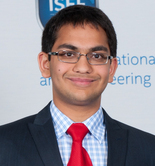 Vikual Gupta, a senior at Oregon Episcopal School is one 40 finalists nationwide participating in The Intel Science Talent Search. The Intel Science Talent Search is considered America’s most prestigious math and science competition for high school students. This year’s Intel Science Talent Search will take place March 10-15 in Washington D.C. Gupta and the other finalists will have the opportunity to have their project critiqued, meet leading scientists, and display their research at the National Geographic society. The winning contestants will be competing for more than $1.2 million in awards.